Developing and get the payment plugins installed for your JobBoard(JB) component to vary the payment methods without the need of digging into the core codes. 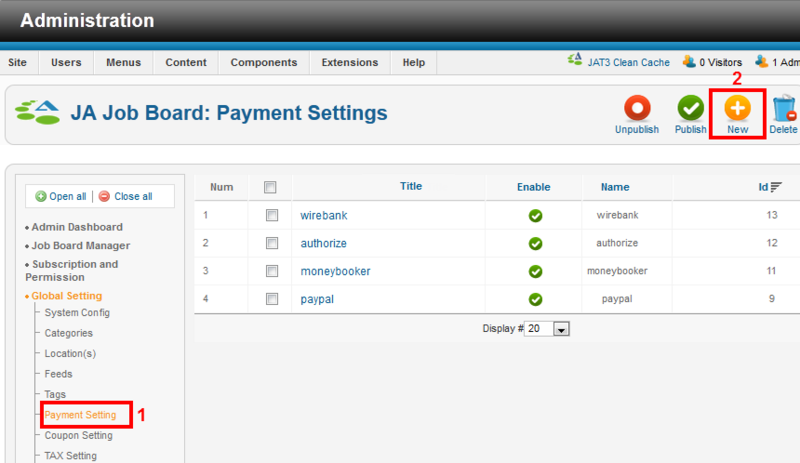 In quickstart package, JB has “Paypal payment plugin” as default payment method. 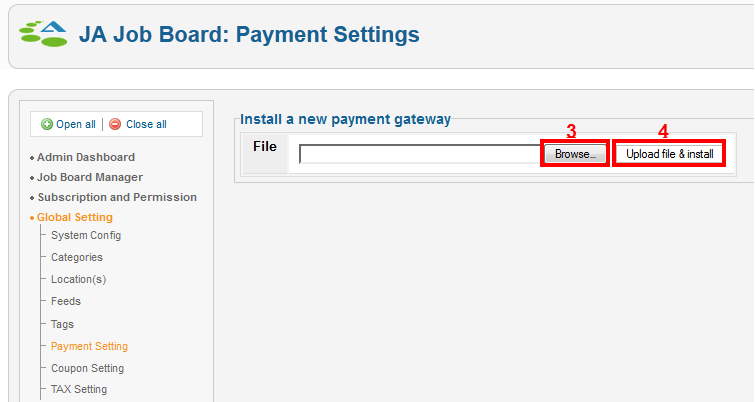 You can download more payment plugin for JB from our forum at: FORUM LINK. We have recently integrated the popular payment gateways such as Paypal, MoneyBooker, Authorize and offline payment named Wirebank. In case, all those payment plugins do not seem to work out with your own preferable payment gateways, this guide is aiming to show you How-to develop the Payment plugins that fit you best. 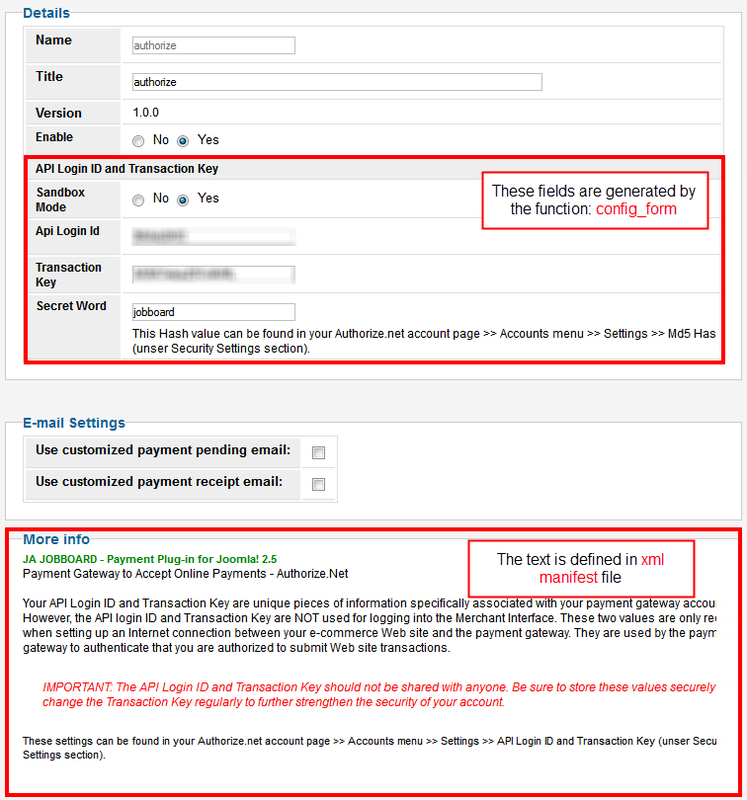 Note: In this guide, we'll be using the payment plugin "Authorize" as an example for better understanding on the guide. When you are ready to develop your own, you only need to replace the "authorize" name with your own plugin's name, and this should be kept consistent in all the files. This How-to provides you the basic understanding of what you should carry out to develop your own plugin. Most plugins consist a single code file, however in order to install the plugin correctly, its code must be packed as a zip format file which can be processed/installed by the JB Payment installer. Description on your plugin goes here. These texts will be displayed in the plugin's configuration form, hence you can also put your plugin's user guide in here as well. Each plugin has to have one php file and a respective file name format in xml file. In the php file, you need to define a class with the required methods to handle the payment events. Below is a sample code of a payment class and a list of required methods for each. * Generate HTML code that will insert the payment configuration form in the back-end. * such as your API key and merchant ID. * you can declare more methods for your class, if necessary.